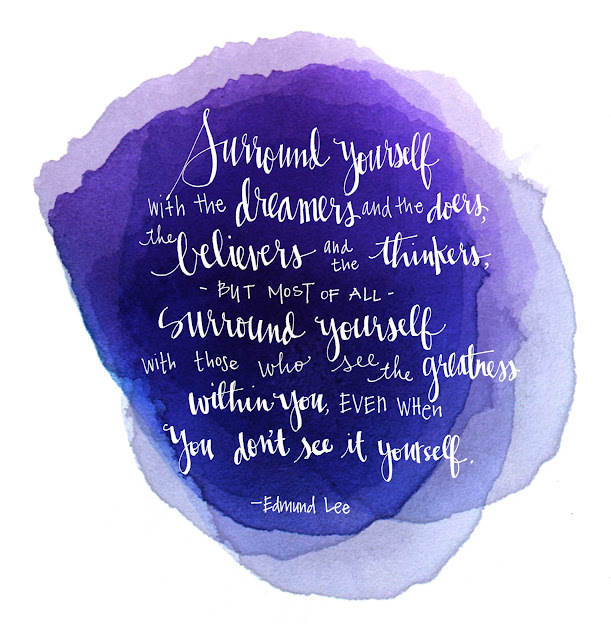 This quote from Edmund Lee [via GnomeAngel] really resonated with me this week. I decided to hand write it so I'd have it handy when that booger of self-doubt makes his periodic appearance. May you also take this advice and share with others as you see fit. I don't know a soul who can't benefit from a little encouragement. UPDATE : Now available as a print in our shop here! Love it! What did you use to make your white lines? Such great lettering. (come to mention it, I really don't think either of you guys would need this quote...at all...your work is always Tops). Hi Nina--I write with a black pen...it's only when I scan it into photoshop that I turn the writing white. Ann--I wish this was the case...but we're no different from anyone else in this area! the quote is as wonderful as your interpretation of it. keep going - you're doing great! enjoy your weekend! Martine Alison, Meg, Cindy--- Thank you all for the encouragement! I think I just died and went to font and design heaven! Love this. linked it up on my blog, hope that is ok. Thanks Wida! We appreciate you sharing!